John a.k.a. Maester Seymour began cosplaying in 2003. He received his B.S. in Biology in 2009, then moved to Austin, TX with his partner to begin graduate school at UT. His goal is to obtain a Ph.D. in Cell & Molecular Biology. He also TAs undergraduate physiology while working in the lab. Though his career is science, his love of cosplaying remains strong. As a native Pennsylvanian, he spent his heaviest cosplaying years (most of high school and part of college) on the east coast con circuit. He prefers cosplaying villains the most, believing that their sinister demeanor is too cool to give up. 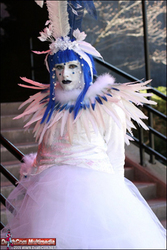 Elements of cosplaying he enjoys most include basic sewing, embroidery, and wigwork. He has loved anime and video games for many years.